A strong mung bean season in Australia has paved the way for crops to get close to average yields. 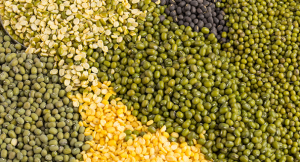 Thanks to strong demand from China and Vietnam, mung bean prices have avoided the India-inspired slump that hit the rest of the pulse market. Mark Schmidt, Australian Mungbean Association president, said there would be an estimated total production between 80, 90,000 tonnes now that harvest has finished. This is above the five-year average to 2016 of 76,000 tonnes. Mr Schmidt said the prices for legumes have increased even with India taking less than 5 percent of total exports this year. Typically, India accounts for between 30-50 percent of Australia’s mungbean exports. Much different to other pulse crops, where India and other destinations command the market, Mr Schmidt said there was a high East Asian demand for mungbeans which were used to make products including cellophane noodles, treasured in Chinese and Vietnamese cooking. Demand from Vietnam and China has helped push the prices for top quality, processing mungbeans to around $1250 a tonne, while manufacturing grade beans are currently selling for around $1050/t. “Prices have risen around $150/t since the crop was planted,” Mr Schmidt said. According to Wayne Newton, AgForce grains section president, growers were reporting a higher percentage than usual of top quality beans thanks to a drier season. Mr Schmidt said most of this year’s mungbeans had been sold. Read our recent post on ‘Optimising Mungbean Yields’ project which is set to better predict what determines mungbean yield in Australia.